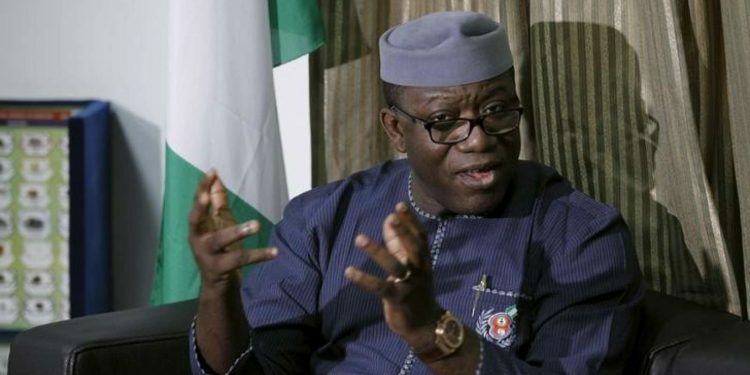 kiti State Governor Kayode Fayemi has said contrary to reports, he never said he would probe the immediate past governor of the state, Ayodele Fayose. Fayemi spoke with newsmen after a closed-door meeting with President Muhammadu Buhari, yesterday, at the Presidential Villa, Abuja. Asked whether he would probe his predecessor, Fayemi said there was never a time he said he would probe Fayose, adding that the decision to probe lies on the table of anti graft agencies. â€œIâ€™m sure I have never said anything about probe; and I do not say anything about probe. â€œLooking into books is the duty of any new governor; I just talked about visitation panel into the education sector, institutions in the state. â€œThere are other sectors in the state; and it will remiss of me not to check what we found when we came into office, and share that with the citizens of the state. â€œIt is just accountability not probe. Iâ€™m not Economic and Financial Crimes Commission (EFCC); Iâ€™m not Independent Corrupt Practices and Other Related Offences Commission (ICPC); there are institutions that are charged with the reasonability to do that and it is entirely up to them, if they want, to probe the governor or not. â€œIt is not my business; I leave the governor to God; Iâ€™ve said that before,â€ he said. Fayose is currently being prosecuted by EFCC over an 11-count charge of conspiracy and money laundering. On the state of education in the state, Fayemi said Ekiti had a tradition of being the intellectual capital of the country, but, it seemed to have lost that edge lately. He said his administration is working towards repositioning the sector, particularly the basic and tertiary sectors. He said he had set up visitation panel in all the tertiary institutions, to review and recommend what the critical and challenging issues are and how government should respond to the yearnings of the sector. Fayemi added that his administration is taking specific steps to address access to education in the basic education sub-sector. â€œBefore now, Ekiti used to be the leading state in terms of school enrolment in the country, but, the latest figures we received from UBEC makes it clear that we are lagging far behind. â€œWeâ€™ve moved from 96 percent enrolment in the entire country to about 45 percent, meaning that about 55 percent of our school age children are out of school enrolment. â€œThat is unacceptable in a state like Ekiti, and we need to find out what has happened between 2014 and 2018 that led to this appalling figure in terms of school enrolment. Hmmmmmmmmm...dey re both birds of same feathers..did fayose probe him wen he took over power from him...?? ?